One of the saddest things that can happen inside my refrigerator is the demise of a gorgeous bunch of herbs. It happens like this: I buy herbs, I have a grand plan to use them, I put it off for a few days, the herbs get bullied toward the back of the fridge, and by the time I find the basil or cilantro the leaves are black and mushy and I shed a tear. Sound familiar? It doesn’t have to be that way. Yes, I know, I should wrap my unwashed fresh herbs first in paper towels and then in plastic, or I should stand them upright in a glass of water, loosely covered with a plastic bag, either on the counter out of direct sunlight (basil) or in the fridge (everything else). I know. But usually, honestly, I just open the fridge and shove ’em in there. Hence my new strategy: use fresh herbs fast. Sure, it’s nice to have some sturdy dill or parsley in the fridge as a spontaneous addition to whatever I might cook later in the week, but if I don’t have an immediate plan for a delicate herb these days, I make it into a sauce and pour it on whatever else I’m eating. Somehow, crunching through an entire bunch of basil in a salad seems daunting, but puree it into a pesto or this basil oil and it easily disappears into one serving bowl of pasta. So I make a lot of pesto (the regulars in my kitchen include cilantro, parsley, and of course basil)–and if you haven’t made this dill butter yet, please stop everything else and do so now. But this basil oil is even simpler than pesto. It takes just one minute and four ingredients, three of which are probably sitting on your countertop right this minute. You can toss it with pasta or drizzle it on fish or a tomato-and-mozzarella salad. Skip those persnickety fava beans and spoon it onto ricotta-topped crostini. Someone in our family even ate some on vanilla ice cream. It’s versatile, is all I’m saying. What a nice way to avoid the sorrow of finding a blackened bunch of basil in the fridge. Basil Oil (Adapted from Bon Appetit): Wash the leaves of one bunch of basil (about 1 packed cup) and blanch them in boiling water for 10 seconds. Drain and rinse in cold water, then pat or squeeze dry. Puree with 1/2 c. olive oil until smooth, then season to taste with salt and pepper. Refrigerate any leftover oil and use it within a few days. This entry was posted in Food, Recipes, Sauces, Vegan or Would-Be-Just-As-Good-Vegan and tagged basil, herbs, pasta sauce, sauce recipe, sauce with fish on August 6, 2012 by emmycooks. Thank you for buying basil, not plucking it fresh, daily out of your organic garden. Enjoy! This really is the easiest herb sauce I’ve made in a long time. Love this! I saw a similar recipe in Bon Appetit, I think, but I haven’t gotten around to trying it. I will now! I too am one of those people who makes a pesto to save the herbs. I can never seem to use a batch before it browns. Oh yeah, the chimichurri sauce looked delicious. Problem is, I always wind up buying the herbs for these sauces and THEN having leftovers instead of using them when I have leftovers already…. How pretty! 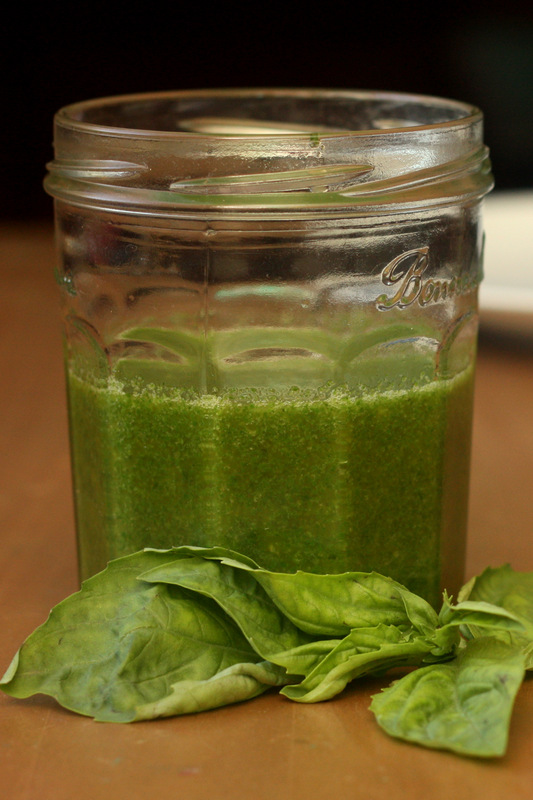 I’m a huge fan of herb oils, but basil is one I’ve never done. You can only have so much pesto in the freezer. This is a great way of using basil when it is in such abundance in the garden. My basil plants thrive in our Maine garden and no matter how much I use in cooking and to dress salads, etc. I still have lots for pesto. I think I’m going to have to eat pesto at least once a week to use it all. Nice! It’s like pared-down pesto. I already put homemade pesto in/on everything, so I can imagine how versatile this must be! I can see it! I’ve had basil flavored ice cream, so it would probably just taste like a slightly strange (oily?) version of that! I HAD the same problem. It was devastating. Now if I’m not planning on using the herbs the same day I buy them I give them a quick rinse, pat them dry, put them in a ziploc and chuck them in the freezer. I do this with ALL my fresh herbs now and it works fabulously. Nearly identical flavor in recipes. Appearance is obviously not the same but no one really notices but me. Even basil? I have successfully frozen dill, parsley, green onions, etc. as you describe (or chopped first), but I think of those as sturdier herbs. I am intrigued to try it with basil, which I always make into pesto before freezing. Try it! You might be surprised. I think it still works beautifully for finishing soups, Asian dishes, etc. Seriously can’t tell the difference in flavor. If you use fresh over hot food, once it hits the heat the fresh batch wilts anyway! I use frozen cilantro for fresh salsa all summer long…. Keeps the leaves vividly green. Hmmm I’ll have to try that. Doesn’t it affect the taste? A little bit. The basil is not quite as sharp and pungent, but it does stay bright. It only blanches for a fraction of a second. When I blanch them, I try to pat the leaves gently dry and resist squeezing them. Nothing worse than soggy leaves! I imagine that you lose a little, but after just 10 seconds the flavor of a leaf was still quite intense. Or maybe ten seconds :-) A fraction of a second wouldn’t really be blanching, I guess! Herbs die in my fridge on a regular basis too. This oil is a perfect solution! 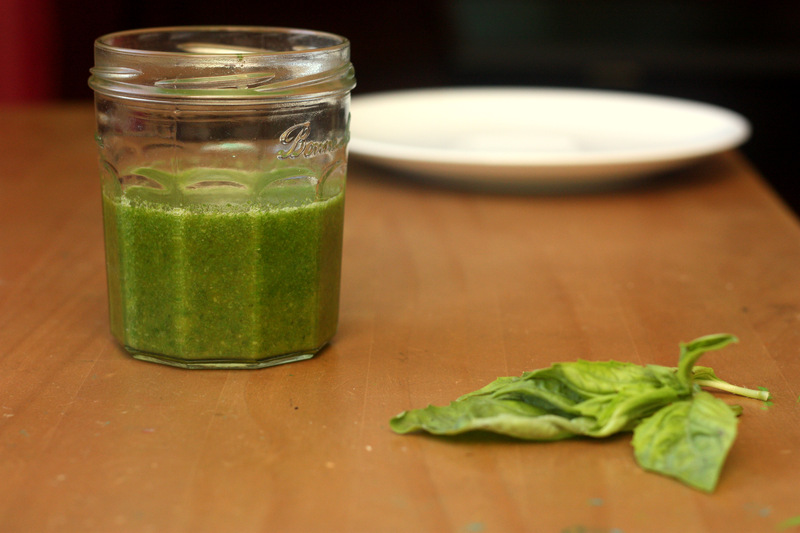 I’ve also had better luck growing herbs and just grabbing leaves as I need them–but the problem is that my basil plants are never big enough for a full batch of pesto. Wow this would be so great with a caprese salad! I just composted some sage I lost somewhere in the veggie bin…so sad. I hate when my herbs go bad too – such a sad waste. Herb oils are always a great idea! I too am guilty of fresh herbi-cide :-( Especially with basil. This is a terrific idea! Basil is so quick to go! I like the idea of keeping it on the counter, if only because it’s there reminding me to use it immediately. I know! I feel like I look at it and it turns brown. A florist friend of mine told me to treat fresh basil like cut flowers. She said she leaves it out on the counter during the day, and puts it in the fridge at night. I find it helps, but it still seems to go so fast! Emmy! Here is a basil trick our CSA taught us that we have been using this summer: when you get it, if the root ball is attached leave it – if it has been cut off at the stem, trim like you would fresh flowers, and put in a vase of clean room temperature water. Keeps on the counter for TWO WEEKS and counting!!! But looks like it is destined for a pretty little mason jar of oil now :) Gorgeous recipe as always. TWO WEEKS? This is going to improve my basil availability substantially, thank you for the tip! I just made this but I don’t know whether it goes in the refrigerator or not? I’m guessing no because the oil will preserve the basil, but…? This basil oil (and any herbs in oil) should be refrigerated and used within a few days or there is a risk of botulism. And thanks for this question–I’ll update the post above! What a brilliant idea!! In NZ we don;t tend to have bunches of basil in the stores so much, they make you buy a WHOLE PLANT and entice you by advertising “living herbs”. You’d think that they would last longer, sometimes they do, but in most cases we still have the same issue as you, they just go to waste :-( What a wonderful idea! I’ll have to use this one. Cheers! !